The expression “Haute Bohème” described how eccentric bourgeois and aristocrats were fascinated by the bohemian way of life, aesthetically and philosophically, at the beginning of the twentieth century. The Haute Bohème trend gave us such masterpieces as La Bohème (1896) by Giacomo Puccini. It was also the idea of the song interpreted in 1965 by Charles Aznavour. More recently, the movie Moulin Rouge! by Baz Luhrmann (2001) with Nicole Kidman and Ewan McGregor depicted this trend where the high society went slumming at the cabaret to see a Bohème-themed play. Flowy ruffle dresses give an air of aristocratic nonchalence. 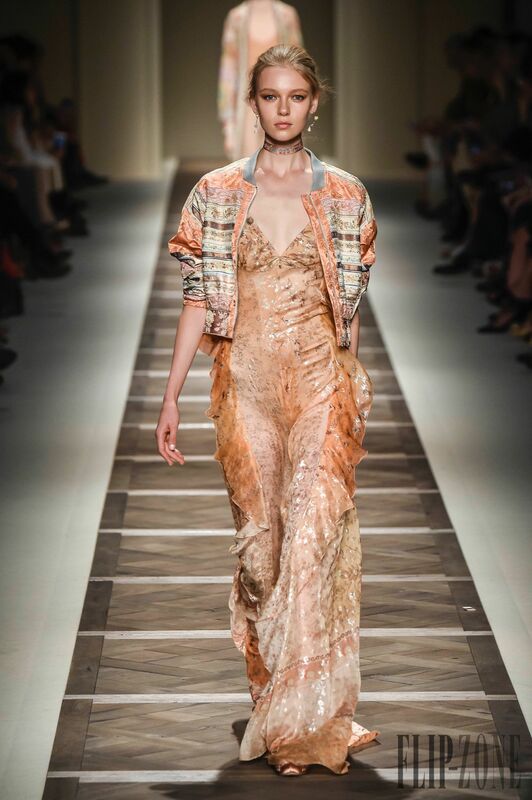 A lot of sensuality showed in Roberto Cavalli’s skin tone, one shouldered long dress and Alberta Ferretti’s false rag-feel camel dress with a transparency that sheds light on a lingerie element. 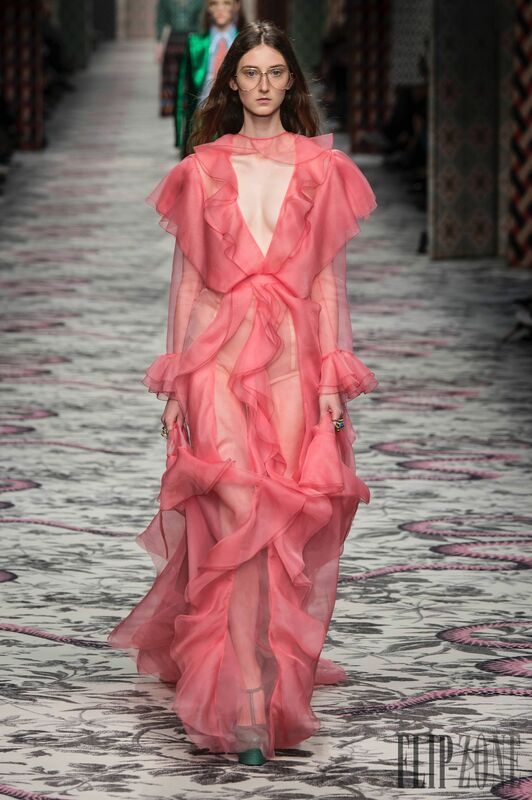 Gucci’s pink dress looked more uptight although quite revealing. Francesco Scognamiglio’s white dress is very evening chic. Accessorized with a T-shirt and hair strass, N° 21 turns the look into a hippie chic bohemian. 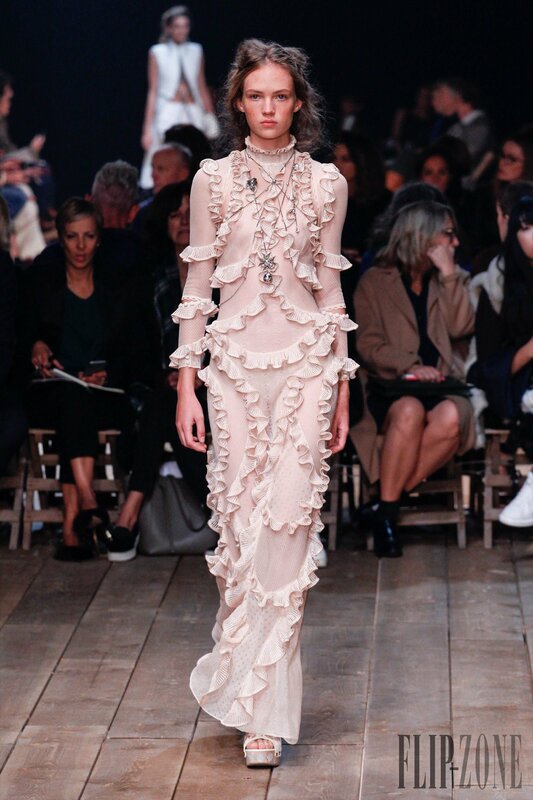 The mix of small ruffles and multi-chains necklaces at Alexander McQueen creates a romantic-rock bohemian. The dentelle and fabric cuts on the chest hint at lingerie. Indeed, lingerie, a strong theme for this season, creates an ethereal sexiness. 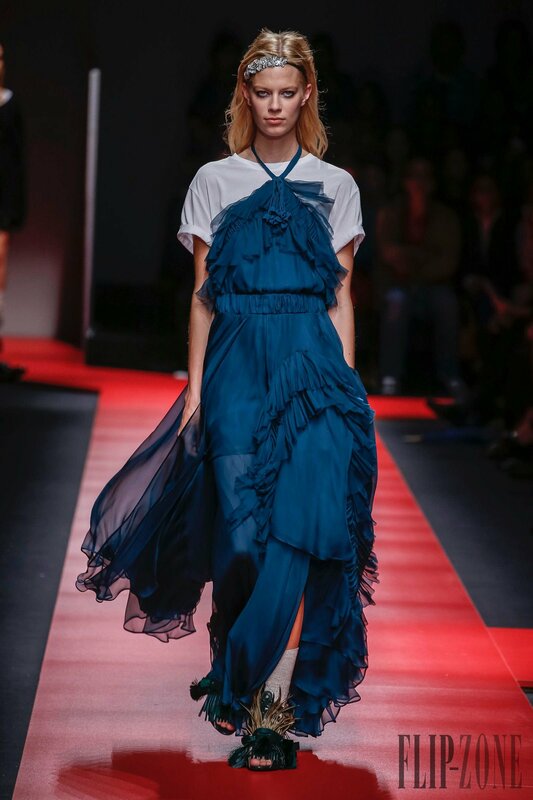 For example Alberta Ferretti’s nighties-like dresses display airiness that is almost surreal and Alexander Wang’s flesh pearly gown exults sensuality. 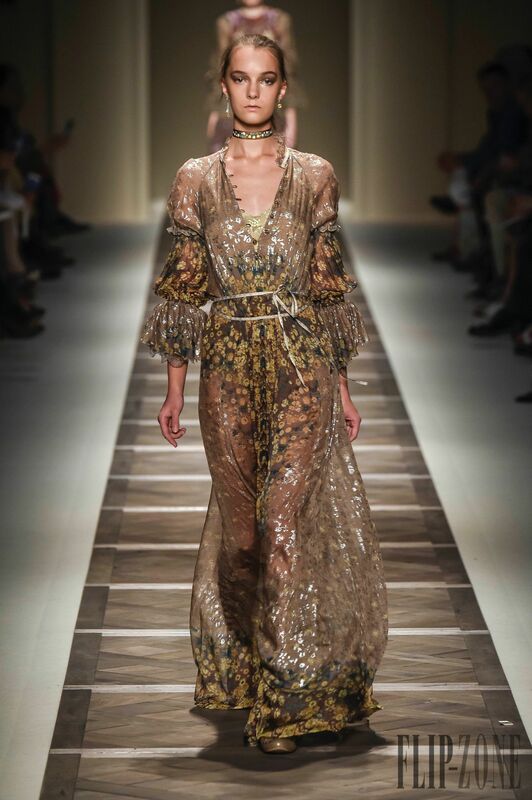 Dentelle and crochet at Elie Saab, Zac Posen and Alberta Ferretti show a delicate boho-chic elegance. 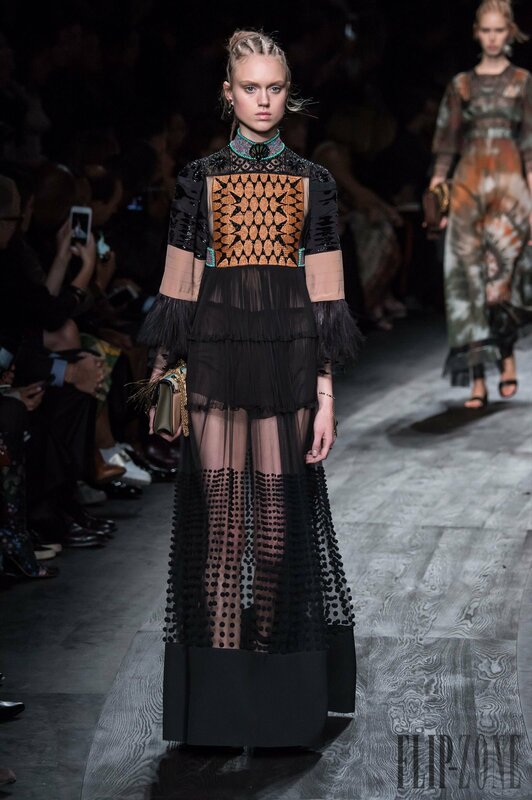 The Valentino dress below displays bohemian grandeur with its transparency, ethnic motifs and patchwork cuts. 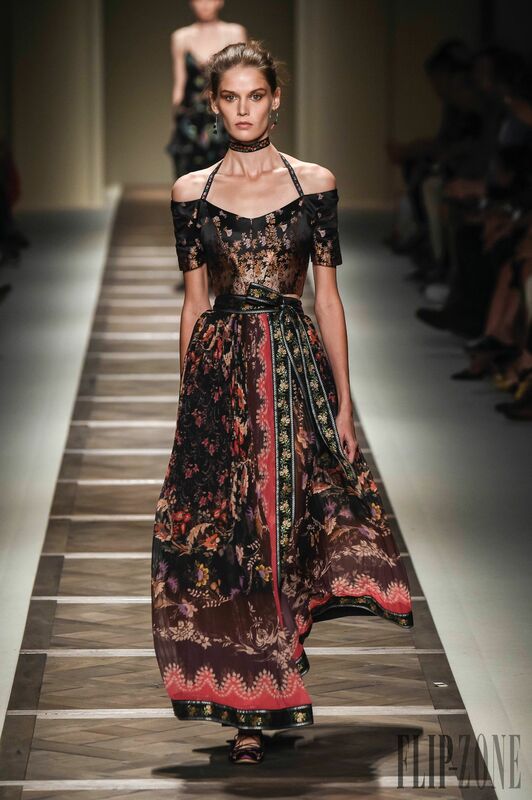 Etro’s collection called “Nomadic Garden”, a pot-pourri colored garden, portrays a bohemian that has the delicateness of a ballerina with flowy dresses, silk ribbons, flat laced shoes, cache-coeur tops and lounge robes. 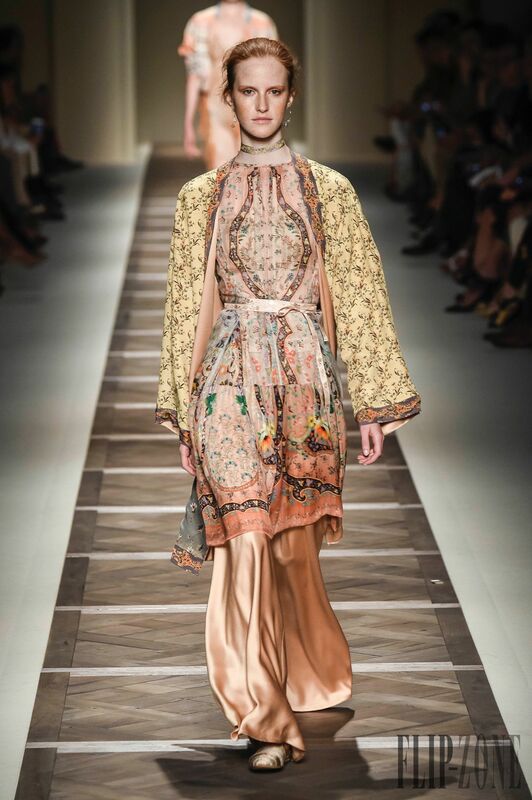 Veronica Etro took advantage of her brand’s strongest points, textile and artisanat, producing a beautifully detailed work of embroidery, lace, crochet, and patterns.